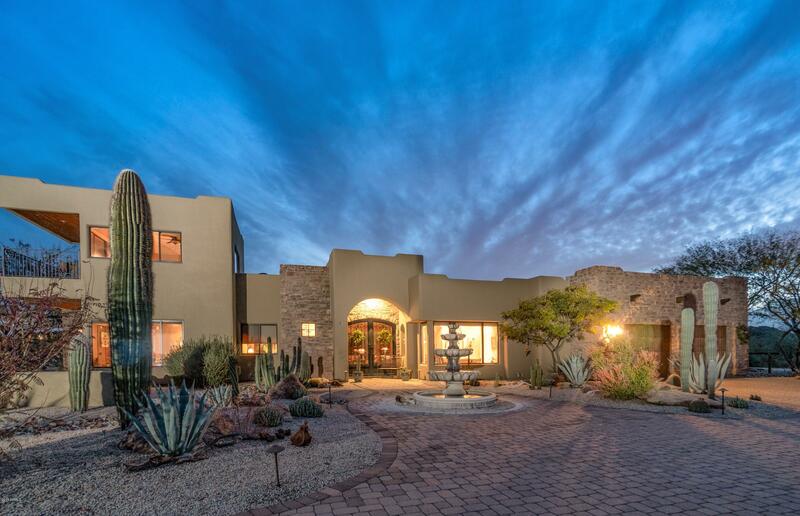 Located on a peaceful cul-de-sac lot (0.785 acres) in the private, gated community of El Mirador at Superstition Mountain, this stunning, steel frame construction luxury home offers almost 5,000 sq. ft. livable and approximately 8,000 sq. ft. under roof with 4 spacious bedrooms (including a 470 sq. ft. guest house with separate entrance), upstairs bonus room with view deck (the only upstairs area in the home), 3.5 bathrooms, 3 fireplaces, 5 car garage (1,772 sq. ft.), and more! High quality finishes and thoughtful design throughout, including warm woods; generous use of interior/exterior stone; gourmet kitchen; romantic master suite with walk through shower, jetted tub, sitting area, and large closet with washer/dryer; amazing outdoor living spaces; and a heated pool/spa. Panoramic views! Builder Name: Steel Eagle Contracting, Inc.